San Mateo | Cummings Moving Co.
QUAINT FACT Back in the day, San Mateo was a stagecoach stop, rail stop and go-to spot for wealthy San Franciscans building summer estates and weekend homes. It is nearly equidistant between San Jose and San Francisco. 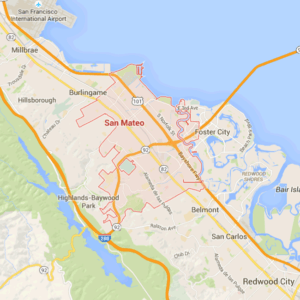 WEATHER & CLIMATE San Mateo is considered Mediterranean in its climate. Summers are warm and dry and winters are mild and damp. While it has seen its fair share of 100+ degree days and has dipped into the teens ant 20’s in winter months, as a rule, it is very comfortable 50-80°F. VISIT SAN MATEO Come for the tech vibe and stay for a meal. San Mateo has been home to some names you may recognize: Youtube, Silicon Valley Innovation Center, BackBlaze and SnapLogic – there are many more! If entrepreneurship and start-ups are your thing then Draper University, downtown on 3rd Avenue, needs to be on your radar – especially for those 18-28. For those done with school and in need of a great night out, the food in San Mateo has quickly become some of the best on the Peninsula. LIVE IN SAN MATEO San Mateo is a very active city with a great sense of community. Many of the schools are blue ribbon schools and there are all sorts of classes for curious adults and children. The city itself has a very “open door” policy with easy access to the City Council, Mayor and Chief of Police. There is a generational sense of local pride, with families choosing to live, work, volunteer and play right here in San Mateo. The city is a hub at the center of roads that lead North to San Francisco, South to San Jose, East across the Hayward/San Mateo Bridge to the East Bay and West to Half Moon Bay and the coast. OUTDOORS San Mateo offers so many wonderful things to do outdoors. It is a family-friendly city with plenty of bay access. San Mateo Japanese Garden – This is one of the most renown Tea Gardens in the Bay Area. It was designed by landscape architect, Nagao Sakurai of the Imperial Palace of Tokyo. As you would expect, there is a granite pagoda, koi pond, tea house and bamboo grove with the Cherry Blossoms in bloom late Winter to early Spring. Please note: No dogs and strollers must be parked at the entrance. Open 7 days. (650) 522-7490. Central Park – The beautiful gazebo is a local wedding destination. Families with young kids can be found in the shaded play structures or at the Bianchi mini train. Additionally, there are lighted tennis courts, a playground and baseball field. San Mateo Arboretum Society -San Mateo Arboretum Society is inside Central Park. They have a nursery with plants for sale that change with the seasons. While they are generally open Tuesday, Thursday and Sunday, it is best to call before you go to make sure they are open 650-579-0536. Coyote Point – Coyote Point Recreation area includes the very cool, castle & dragon themed Magic Mountain Playground. Other activities include swimming, windsurfing, bicycling, jogging, fishing, boating, and sailing. Explore the Wildlife Habitats, the beach promenade, or the marina and its breakwater, or explore the saltwater marsh. Picniking is always encouraged. CuriOddessey – More than just an indoor, hands-on space where kids (ages 2-10) are inspired by nature and science. CuriOddessey has plenty to do outdoors too. The animal habitats and nearly 1.5 acre garden are a joy to investigate. The garden is enjoyed as much for relaxation as it is used by classes and programs investigate plants, insects, and birds. Certain sections of the garden have been designed to naturally attract butterflies and hummingbirds – so you never know exactly what might be flying in and out of the seasonal plants. Sawyer Camp Trail – The Sawyer Camp Trail runs from Crystal Springs Reservoir to San Andreas Lake and is one of the most popular in the Bay Area for those on bikes, blades or pushing babies in strollers. It is 6 paved miles through the San Francisco Watershed lands and while not a wilderness experience, it is has great wheelchair access and offers an easy way to get outdoors. Pulgas Water Temple -This is truly a hidden gem and a lovely place to relax in the sun. Many Bay Area residents learn about the Pulgas Water Temple after attending a wedding on the property. Designed in the Beaux Arts style by William Merchant, this picture-perfect temple, its reflecting pool and gardens are a delight. Bring a lunch and enjoy learning about the site’s historical and architectural significance. It’s quite a story. INDOORS With weather as great is it is in San Mateo, indoor adventures often have an outdoor element to them. From science to SCUBA, fitness for kids, computer classes and lectures, you will find a variety of things to do via these links. If you plan on moving to San Mateo with your four-legged family members, here’s a few tips to make the the trip go smoothly. Your crew was great and our overall moving experience was as easy and stress-free as one could hope. The guys were quick, efficient, professional, and courteous. If/When we ever move again, we will definitely call Cummings. Thank you! Your crew was incredible!!! They were efficient and very patient when we were placing furniture in our new house. They had great senses of humor and were fun to work with. Our move was less painful thanks to them!